According to the Florida Department of Health, Bureau of Vital Statistics, suffocation (sleep related death) is the leading cause of death for children less than 1 year of age in Collier County. The Safe & Healthy Children’s Coalition supports new recommendations issued by the American Academy of Pediatrics (AAP). These new recommendations aim to reduce the risk of infant death from SIDS as well as death from known sleep-related causes. 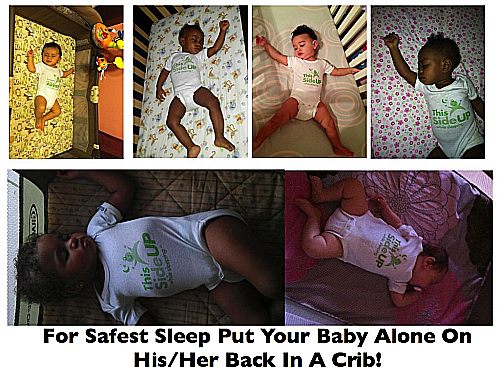 Babies up to 1 year of age should always be placed on their backs to sleep during naps and at night. However, if your baby has rolled from his back to his side or stomach on his own, he can be left in that position if he is already able to roll from tummy to back and back to tummy. If your baby falls asleep in a car safety seat, stroller, swing, infant carrier, or infant sling he should be moved to a firm sleep surface as soon as possible. The crib, bassinet, portable crib, or play yard should meet current safety standards. Check to make sure the product has not been recalled. Do not use a crib that is broken or missing parts, or has drop-side rails. Cover the mattress that comes with the product with a fitted sheet. Do not put blankets or pillows between the mattress and the fitted sheet. Never put your baby to sleep on a chair, sofa, water bed, cushion, or sheepskin. For more information about crib safety standards, visit the Consumer Product Safety Commission Web site at www.cpsc.gov. Keep soft objects, loose bedding, or any objects that could increase the risk of entrapment, suffocation, or strangulation out of the crib.Pillows, quilts, comforters, sheepskins, bumper pads, and stuffed toys can cause your baby to suffocate. Note: Research has not shown us when it’s 100% safe to have these objects in the crib; however, most experts agree that after 12 months of age these objects pose little risk to healthy babies. Place your baby to sleep in the same room where you sleep but not the same bed. Products such as wedges, positioners, special mattresses, and specialized sleep surfaces have not been shown to reduce the risk of SIDS. In addition, some infants have suffocated while using these products. What expectant moms can do? Source Baby Safely to Sleep: How Parents Can Reduce the Risk of SIDS and Suffocation from the American Academy of Pediatrics. Safe Sleep Practices from Eastern Virginia Medical School on Vimeo.